7/169 Max Braden The style and tone of this movie is a little jarring - it feels like something Paul Verhoven would have directed. It's too bad The Comedian is despicable, but Rorschach's scenes are excellent. 7/21 Jason Lee An interesting exploration of the inability for superheroes to establish healthy interpersonal relationships. 17/20 Les Winan Visually tremendous and certainly the most literal possible adaptation of the source material. Malin Akerman, despite her beauty, is the weak point. 76/82 Kelly Metz Another superhero waste of time movie. Boring plot, horrible acting. Completely pointless. This movie could not end fast enough (which sucked, since it seemed to never end). Who watches the Watchmen? Now is the time to discover on your own. If you are one of the 73 gazillion people who saw The Dark Knight or watched the trailer for Watchmen online, you are probably wondering what in the world this is. The answer lies in going to Amazon.com and spending $10 (probably less than you paid for your Batman IMAX tickets) to buy one of the most heralded books of the 20th century. And you'll note I said books instead of graphic novels. Time Magazine agrees with me as they named Alan Moore's masterwork one of the 100 greatest novels of the past 80 years. This is lofty praise for a comic book, right? So, the obvious question is what makes Watchmen so special? Alan Moore may be crazy (and I think we're all pretty sure he is), but the man has one of the most impressive talents for deconstruction in the world today. What the iconoclast did with Watchmen was evaluate the most popular comic book characters and find a way to re-interpret their behavior in a way that had never been successfully attempted before. DC Comics favorites such as Superman, Batman, Blue Beetle, The Question and The Black Canary (as well as some older, lesser known characters from Charlton Comics) were the impetus for his character studies with the idea being, "What would it take for an ordinary person to dress up in a costume every night?" Circling back to those of you who have been celebrating The Dark Knight in recent days, this idea may seem familiar now, meaning you have Mr. Moore to thank in some small part for your celebration of an evolutionary successor to his premise. Set in a dystopian version of 1985, Watchmen has two eccentricities. The first is that after winning the Vietnam War emphatically, Richard Nixon effectively has become President for Life of the United States. The second plays into the first. A scientist named Jonathan Osterman, the son of a watchmaker, is accidentally disintegrated in a freak lab experiment. His essence continues on beyond this tragedy, causing him to return in relatively human form (albeit with blue skin). The catch is that he has developed borderline omnipotent abilities. He can split into multiple forms, he can grow gigantic in stature, and he can exist in multiple time periods at once. Effectively, he is a deluxe version of Superman in terms of power. His strength is so overwhelming that he almost single-handedly wipes out the Vietnamese army. Such a potent force creates a strange sort of détente across the world as people grow fearful that if they anger Nixon, he will unleash his weapon as a countermeasure. The problem is that the presence of this "superhero" named Dr. Manhattan is that his existence is equally uncomfortable for Americans. His potency makes others feel...impotent. Seeking to dissuade such concerns, the government constructs a group to join forces with Dr. Manhattan. These six people lack metahuman abilities. Instead, they are ordinary people whose primary abilities are less obvious. The Comedian is effectively The Joker as a "good guy". He's just as malevolent but as a government tool, his violent tendencies are accepted as a necessary evil. That is not the case with Rorschach, an exploration to the logical extreme of the Batman vigilante archetype in combination with the paranoia of The Question. Rorschach accepts no illicit behavior of any sort and will emphatically punish any and all wrong doers independent of whether the level of punishment fits the crime. These two are kindred spirits while the rest of the group is more positive in tone. There is The Nite Owl, a financially wealthy man who feels like more of a man when he wears a costume; there is Ozymandias, the smartest man in the world; there is Captain Metropolis, the leader of the group who happens to be a closeted homosexual and oddly indecisive for a commander; and there is The Silk Spectre, a woman in slutty attire who takes on the burlesque superhero title made famous by her mother. Together, they are a bunch of freaks and a mutant. Their struggles are shown in a combination of fractured time for back story coinciding with a murder mystery involving the seemingly systematic execution of former members of the group. What follows is Rorschach and The Nite Owl's joint investigations into the crimes that have ended the lives of their friends. The journey itself is engaging but the depth of backstory is what sets Watchmen apart. Moore implements a fully realized world wherein the behavior of all the characters is understandable even when it's morally reprehensible. Watchmen will be released into theaters on March 9, 2009, and BOP has high hopes for the theatrical adaptation given the fact that it is directed by Zach Snyder. His work on the Dawn of the Dead re-make as well as 300 has been striking for such an inexperienced movie maker. Even so, BOP strongly recommends that you do yourself a favor and pick up a copy of the book first. It's a much deeper and more robust exploration of the world of Watchmen than a two and a half hour movie could hope to be. We had hoped that this would eventually be developed into a limited series on HBO or the like in order to give a respectful treatment of the source material. Read the book and you'll better appreciate why we feel so strongly about this. 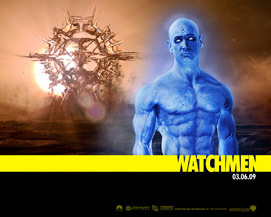 See the latest developments for this project on the Watchmen Movie News page.